Image of a horned skull, often mistakenly thought to be that of a possible giant Nephilim, dated c. 1200 A.D. and originally unearthed during an archeological excavation in the 1880s at Spanish Hill, near Sayre and South Waverly, PA, led by the Rev. Dr. George Patterson Donehoo, Alanson Buck Skinner, and Warren King Moorehead. However, this skull turns out to actually be a manufactured cult object, currently in the collection of the mysterious museum, Surnateum. According to its curator, Christian Chelman, "It's not a giant skull but a human size ritual skull made for a Pan cult revival during the XVIIIth century at Painswick (Gloucestershire). Yours, the Curator." Visit www.surnateum.org to see a wealth of delightfully strange and wondrous objects! We had a great visit with Carel while delivering his Astonishing Legends "Thank You" gift hats! And he was kind enough to give Scott's son an autographed photo of him as "Arquillian" from Men In Black! NOT the skull of a horned giant! This skull turns out to actually be a manufactured cult object, currently in the collection of the mysterious museum, Surnateum. According to its curator, Christian Chelman, "It's not a giant skull but a human size ritual skull made for a Pan cult revival during the XVIIIth century at Painswick (Gloucestershire). Yours, the Curator." Visit www.surnateum.org to see a wealth of delightfully strange and wondrous objects! Illustration by Micah Ewers from his rephaim23 website. Illustration by Micah Ewers, from his rephaim23 website. Illustration of Paul Bunyan and his blue ox "Babe" by Astonishing Legends' resident artist Chad Lewis. Go to www.chadlewisart.com to see more of Chad's fantastic artwork, or commission him to create an original piece! Image copyright Chad Lewis Art 2016. 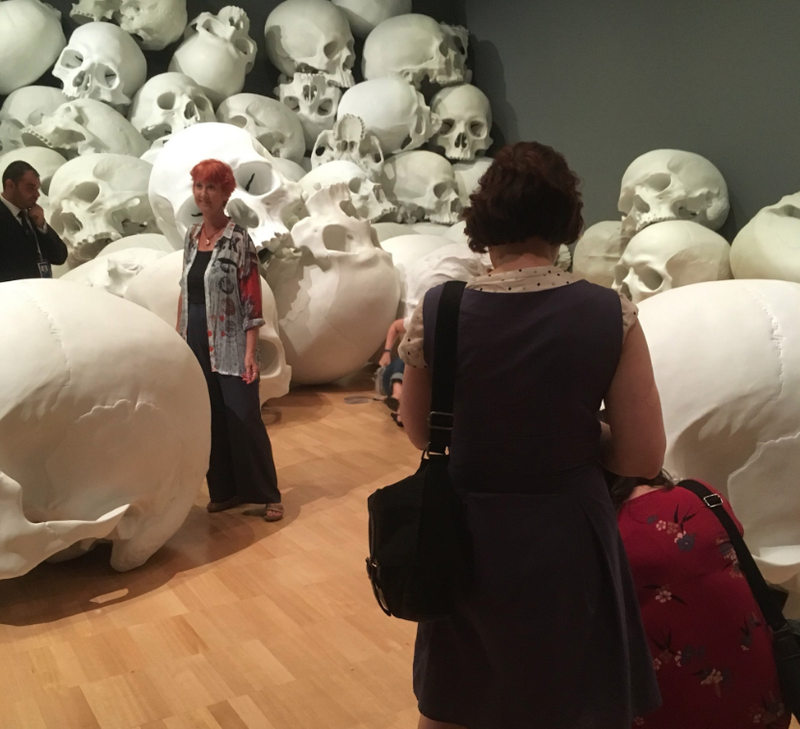 Picture provided by listener "JoMo" (@leopardboy on Twitter) of Sculptor Ron Mueck's installation featuring giant skulls, on display at the Australian National Gallery of Victoria Triennial museum. From biblicalarchaeology.org: "This colossal figure choking a lion once stood at the palace of Assyrian king Sargon II at Khorsabad in northern Iraq. Often identified with the hero Gilgamesh, the statue now resides at the Louvre Museum in Paris. Photo: Musée du Louvre, Paris." It looks like he's also wearing a watch. From Wikipedia: The Fall of the Rebel Angels by Hieronymus Bosch is based on Genesis 6:1-4. Fragment (inner-left wing) of a triptych. 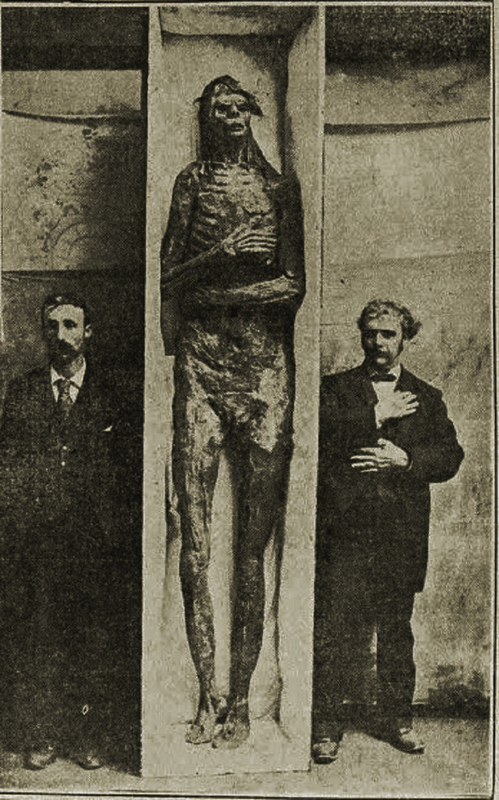 Image from the newspaper, The World, Sunday, October 6, 1895, with the headline: "BIGGEST GIANT EVER KNOWN – Nine Feet High and Probably a Prehistoric California Indian – Measurement Well Authenticated"
LOCATION: Castelnau-le-Lez, France where Georges Vacher de Lapouge discovered 3 massive bone fragments in 1890. He estimated from the bone size that the human may have been about 11 feet and 5 or 6 inches tall (3.5 meters), and perhaps weighing as much as 1000 pounds (454 kg). The find is now known as The Giant of Castelnau. So, what have we learned about giants? Our current understanding of human biology finds limits as to how tall a person can grow and can still be relatively healthy while enjoying an advanced age. This knowledge then places limits as to what the majority are willing to believe about the tallest humans throughout all history, that no one could have existed beyond 8 to 10 feet tall at the most. In the still-nascent field of archeology in the 19th century, excavations do seem to provide accounts of unusually large individuals in Europe and significant numbers of taller than average Native American tribal members here in the U.S., so perhaps whole communities could have been seen as giants by contemporary standards. However, there are those researchers and writers who believe, possibly spurred by those findings and the subsequent, apparent mishandling of artifacts by some museums and academic institutions, that there exists a conspiracy to keep evidence of beings beyond that range from the public, and that the even more massive giants of yore were real, and some may even live to this day. If this is true, then one must think about our definition of a real giant, and would that giant be a real human? From the Ancient Secret Discoveries YouTube Channel: "GIANTS WERE REAL Here Is the Proof that They Forgot To Hide"
Deb Twigg's Spanish Hill website, regarding the Sayre and South Waverly finds of "Giants"
L.A. Marzulli's Episode #18 on the "Giant of Kandahar, Afganistan"
Elongated Human Skulls Of Peru: Possible Evidence Of A Lost Human Species? Z3 News: Are the Nephilim back? Old newspaper clipping PDF: "Explorer Finds Giant's Skull in South America"
From The Guardian: How Tall Can a Human Grow? From the BBC: "Will Humans Keep Getting Taller? Genesis 6 Giants, website by Steve Quayle – "The Leading Authority on Giants"
The context of Abraham Lincoln's line: "The Eyes of that Species of Extinct Giants ..."
Was Paul Bunyan a real person? Was there a real Paul Bunyan? There's a brand-new podcast from audioBoom called MAFIA, which takes us all into America’s criminal underworld, exploring the lives and careers of the most powerful gangsters the world has ever seen! Through extensive research and eyewitness stories, MAFIA reveals what life was really like inside the mob from the people who lived it. Every Wednesday, MAFIA dives into the larger-than-life stories of mobsters and introduces us to the key figures who brought them down. Subscribe to MAFIA on Apple Podcasts and every other listening destination. Episode 99: The Tall Ones Part 3. Produced by Scott Philbrook & Forrest Burgess; Audio Editing by Sarah Vorhees Wendel; Ryan McCullough Sound Design; Research Assistance by Tess Pfeifle and the astonishing League of Astonishing Researchers, a.k.a. The Astonishing Research Corps, or "A.R.C." for short. Copyright 2018 Astonishing Legends Productions, LLC. All Rights Reserved. "It was taught by the wise men of the Sioux tribe that the earth was originally peopled by giants, who were fully three times the size of modern men. They were so swift and powerful that they could run alongside a buffalo, take the animal under one arm, and tear off a leg, and eat it as they ran." LOCATION: Spanish Hill, near the communities of South Waverly and Sayre, Pennsylvania, where a supposedly 7' tall skeleton with horns and two rows of teeth was unearthed in the late 1880s from a pre-Columbian burial mound. What constitutes a "giant" in your mind? Certainly, people who are 6 to 7 feet tall are commonplace nowadays, unlike the Middle Ages, or even a hundred years ago. But what about someone who's seven feet tall or more? We may call them "giants" in jest, but it's not the same as when we think of the giants in our legends. A measurement of more than seven feet is rare, but there are plenty of healthy people living today in that range that prove it's not so legendary by our contemporary imagination. Rarer still is a human that's eight feet tall, but there has been one in recent history: Robert Pershing Wadlow stood 8' 11.1" tall (2.72 m) and weighed 490 pounds (220 kg) and showed no signs of stopping his growth at his untimely death in 1940 at age 22. So it's possible that a height for a human can approach nine feet, but could any height beyond that be sustainable? Because taller than that and it seems we venture beyond not only what is biologically viable for the human body, but also what is believable. It still leaves us with the question, "What makes a giant?" And if a skeleton is unearthed that appears to have horns? Well, that is another matter altogether. MVMT Watches – Score some major points with your special someone this Valentine's Day! MVMT's team of in-house stylists have designed an interactive gift guide, where you can get a superbly stylish watch, bracelet or pair of sunglasses for him or her, or any combination of those items, beautifully packaged in one of their limited edition gift boxes, all set to impress! Get 15% OFF today with FREE SHIPPING and FREE RETURNS — by going to MVMT.com/LEGENDS. Join the Movement! Are you looking for a brand new podcast that's as vast as space and as timeless as infinity? A podcast that’s the meeting place between alien documentaries and Frasier? Then a brand-new podcast from audioBoom called Night Call is just what you’ve been waiting for! Grantland alumni Molly Lambert, Tess Lynch, and Emily Yoshida bring you a weekly podcast to keep you company during lonely nights and strange days. Every Monday Night Call’s bicoastal hosts sit down for a free jazz blend of pop culture, internet culture, and just enough half-baked conspiracies to keep things interesting. So call 2-4-0-4-6-N-I-G-H-T or email them at nightcallpodcast@gmail.com and they’ll offer their best advice on life, love, and the coming apocalypse. Night Call is available now on Apple Podcasts and all other listening destinations. Episode 98: The Tall Ones Part 2. Produced by Scott Philbrook & Forrest Burgess; Audio Editing by Sarah Vorhees Wendel; Ryan McCullough Sound Design; Research Assistance by Tess Pfeifle and the astonishing League of Astonishing Researchers, a.k.a. The Astonishing Research Corps, or "A.R.C." for short. Copyright 2018 Astonishing Legends Productions, LLC. All Rights Reserved. It's easy to imagine a version of ourselves that's gargantuan, magical, a hero that often plays the villain, a giant among the ordinary. Legends of giants doing as they please have been with us since the beginning and continue to fascinate us in cinema and sport. The idea of a giant is easy to entertain because either through genetics or rare disorders, extra-large humans have naturally lived throughout our existence. The idea that's not easy for the modern person to imagine, aside from a singular Goliath-like demigod here n' there, is the possibility of a race of giants having once existed, tribes of superhumans whose feats and physicality filled us with fear and wonder in antiquity. Yet with these tall tales being so pervasive worldwide, could it be that communities of giants were real or was it merely that the occasional taller than average human became the inspiration for myth? Join us tonight as we explore the mystery of legendary giants. Episode 96: The Tall Ones Part 1. Produced by Scott Philbrook & Forrest Burgess; Audio Editing by Sarah Vorhees Wendel; Ryan McCullough Sound Design; Research Assistance by Tess Pfeifle and the astonishing League of Astonishing Researchers, a.k.a. The Astonishing Research Corps, or "A.R.C." for short. Copyright 2018 Astonishing Legends Productions, LLC. All Rights Reserved.